A widely known stock chart pattern that signals a trend reversal is double tops and bottoms. This stock market indicator is considered to be one of the most reliable and is commonly used. Double tops and bottoms patterns are formed after a sustained trend and signal to chartists that the trend is about to reverse. The pattern is created when a price movement tests the support or resistance levels of a security two times but is unable to break through either barrier. The double tops and bottoms pattern is often used to signal intermediate and long-term trend reversals. Double tops is a technical analysis term that represents two successive rises to the same price level and it resembles the shape of a "M" on the chart. The particular price level where the double top occurs is considered a resistance level for the stock, because technical analysts believe that the stock is having difficulty rising above that level. 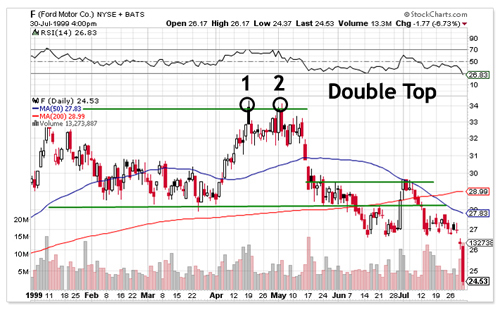 In the case of the double top, the price movement has tried two consecutive times to move above a certain price level. After two unsuccessful attempts at pushing the price higher, the trend reverses and the price heads lower. 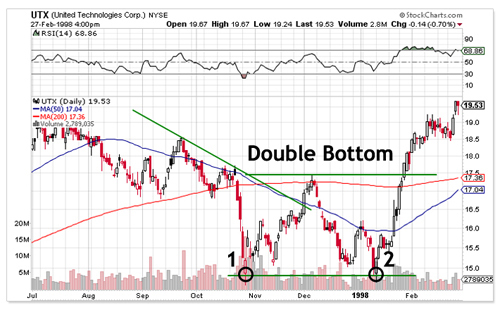 Double bottom is a technical analysis termthat’s used to describe a chart on which the price of a security has made two approximately equal bottoms over a period of time. Technical analysts try to buy at one of the bottoms in anticipation of a rise (which would make the shape of a "W" on the chart). A double bottom is the direct opposite of double top. In the case of a double bottom, the price movement has dipped lower two consecutive times, but has failed to break through the support level each time. After the second bounce off of the support, the security enters a new trend and heads upward. If you are interested in applying double tops and bottoms technical analysis to your stock picks, you may want to consider signing up for a risk-free 14 day free trial of SmarTrend – and take the guesswork out of your trading.